Big Canvas is now unwrapped! Thanks to last Friday’s post, I was finally able to settle on an idea for the large canvas (24″ x 36″) that’s been sitting in my room since the beginning of the year. Behold the power of a productive weekend! Out of all the beautiful shots from this W Korea photoshoot, after much consideration I decided on this image because it contained just the right amount of elements to challenge me. I could’ve played it safe by sticking to a portrait shot, but I can’t remember the last time I painted/drew something with multiple human subjects so I figured it was time to give it a try. Given how much I’m blowing this up I thought it’d be wise to grid things out to keep the proportions correct. Normally I’m on the fence about gridding (I’d rather challenge myself to measure correctly with my own eyes) but in this case, it was necessary. Saturday afternoon and evening were spent laying out the grid and pencilling as much in as I could. Sunday afternoon, I dove in with a mix of blues for the underpainting! The fabrics in the original have a sort of bluish undertone and I’ve been wanting to try underpainting with colors other than Burnt Sienna, so this was the perfect opporitunity to give it a go. I love painting with blue, it’s my favorite color. So far I’m happy with progress but I’m a little concerned that my pencil lines are too dark. Eep. Using a darker palette has been interesting. I’m trying to get the clock out of the way so I can focus on blocking in the horizon, trees and then look at filling in the skulls. I’m not really sure what colors I’m going to use for them quite yet, or how I’m going to light them. Hopefully my week can be as productive as the weekend was! I got so much cleaning done and even got in some baking. Working in a clean space is important to me. Otherwise, I get distracted by things that need to be put away. A space that is clean is so much more relaxing and serene. Spring cleaning, indeed! 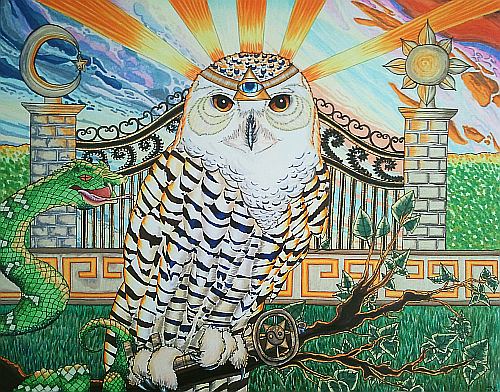 This week I decided to tackle the sky in my Guidance Owl illustration. I knew I wanted a sunset/dusk type sky with lots of intense color. Lighting in this piece is key; I’ve kept it in mind when coloring every single part of it, wanting the sun to touch everything. After studying some pictures of sunsets all over the world, in cloudy skies and skies devoid of even stars, I picked some colors and jumped right in (with the help of Mogwai’s new album, which turned out to be amazing coloring music). The feeling of taking a risk and coming out on the other side with something I’m happy with, that feeling is one of the things I live for in art. Though the cloud shapes are kind of funky, they’re vibrant and flowing and moody. I’m ~very~ happy with them… so much so that for the first time, I’m considering studying some landscapes using my markers to get a better feel for environments like this. One of my colleagues who became a good friend of mine over the past few years is leaving work. For a gift to her, I got a print done of my cherry blossom drawing from last year. Here are the two compared. The print is slightly more saturated and dark compared to the original but I feel that enhances it a bit. She seemed pleased by it, so I’m happy too. To round off this Friday afternoon post, here are some time-lapse art videos that I enjoyed. The first and second videos belong to Amanda Mocci, who combines the fine detail work of illustration and pencil with bold bright colors achieved through use of gouache. She’s recording several time-lapse videos of her artwork, shown below. Watching other artists is such a great learning experience. With Amanda, it looks like she keeps a blank piece of paper under her hand, when using pencil, so that she doesn’t smug the work all to pieces. With the amount of pencil and detail she uses this makes sense and is something I’ll definitely be trying out for myself. DARK WINGS – A portrait by Amanda Mocci from Amanda Mocci on Vimeo. REVIVAL – A Process Film By Amanda Mocci from Amanda Mocci on Vimeo. Gabrielle Rose combines ink-based illustration with water-colors. She seems to have the wet-on-wet technique of painting down pat, to a point where she can control exactly where the paint will travel when she tilts the page. It’s beautiful and fascinating to watch. She’s able to blend contrasting colors masterfully. Leaky Eyes Time Lapse from draw Gabby draw! on Vimeo. I felt like it was finished after I’d blocked in all the color yesterday afternoon, but now I’m feeling like it’s missing something. I’m thinking of darkening some of the shadows on the owl to make him stand out more. I took a really different direction with Athena; at first I wanted to color her like a gypsy tattoo but as I got further into coloring the owl, I realized that too much additional colors could be overwhelming. So, instead of using skin tones and bright blush/lipstick I kept the flowers colored and made her into a statue. I’m very happy with the way she turned out and I’m glad I made that last minute coloring decision (besides, it would’ve been a bit awkward having a live woman with flowers in her eyes, right?). With all the bright colors in front I chose to keep the sky calm and light, though I may go back in with a few greys to give it some depth. What do you all think? Whoa. Okay. I just got another idea writing up this post. Instead of limiting myself to british rock bands, I could expand to include all the things I love about the UK (tea, fashion… and an embarrassing amount of TV-related stuff like Top Gear, Doctor Who, James Bond, etc etc). If I were to include references to all of those things, using the bigger canvas would make more sense. One of my friends has this wicked coffee table that has a bunch of rock legends’ heads painted on top of it. Hanging something like that in the living room would be a super cool conversational piece. Am I up to the challenge? HELL YEAH! At the moment my abstract painting seems to be mocking me a bit. I’m not really sure where to take it from where it is and may just give up and hang it. Maybe I should put it away and look at it fresh in a few weeks, and make a final decision then. I’ll round out this post with a recommendation to check out Big Wreck’s new album (remember That Song? “So I always get nostalgic with that song… but in my room it’s forced”): 30 second clips tracks from Albatross. I bought this on a whim Saturday afternoon and have been listening to it non-stop ever since. It’s a rock album classified as “neo prog” which just means they’re not afraid of using lots of different instruments. It’s a rocky bluesy mix all rolled into one aurally immersive experience and so easy to sink your teeth into. It’s solid enough that I find myself listening to it all the way through. Ian Thornley’s raw vocals are top-notch and his education at Berkley has given his guitar melodies a rich diversity, without the music being pretentious. So, if you’re looking for some new tunes different than what you’ve been hearing from the Top 40, definitely give this album a spin.